The University of Teramo has 5 Faculties, 16 Degree Programmes, more than 20 Masters, 6 Specialisation Schools and is involved in 10 research areas. We have two centres of excellence - dealing with law, politics and communication on the one hand, and with studies in agriculture, biology and veterinary medicine on the other. From such strong points, innovative educational paths have originated, also creating a link to the job market. Research has achieved concrete results enabling our University to build a very close network of relations within the scientific community worldwide. Both postgraduate and vocational training guarantees high-level proficiency in several areas - legal professions, economics, social sciences, communication, management, politics, governance as well as animal health. 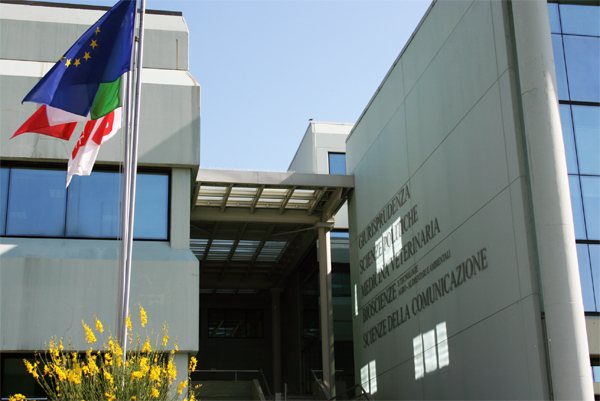 Internationalisation in and beyond EU Member States is a key element of the University of Teramo, which has set up fruitful collaborations with the centres of excellence located in the US, on the Adriatic coast and in Latin America. Such internationalisation is underpinned by integrating the ministerial grants for student mobility with University funds and strengthening University Language Centre's activities in order to enhance foreign language learning. ICTs have always influenced both our way of thinking and teaching/learning methods. As a result, an e-learning platform and language, multimedia, television and radio laboratories have been implemented over the last few years. Campus Coste St. Agostino: 50,000 m2 wide. It hosts the Rector's Office, the Faculty of Law, the Faculty of Political Science, the Faculty of Communication Science, the first two years of the degree programmes of the Faculty of Veterinary Medicine as well as the degree programmes in Biotechnology. This campus hosts also a canteen, a TV studio, a University radio and a movie hall where live shows are held as well. University Veterinary Teaching Hospital: 100,000 m2 wide. It hosts the second three years of the degree programme of the Faculty of Veterinary Medicine. Faculty of Bioscience and Agro-Food and Environmental Technology. The University of Teramo is facing significant and substantial changes to relaunch your future. We are turning into a real University Campus - with the main premises open until midnight, an inner canteen, a unified library, a language centre, a computer learning centre, technical and scientific laboratories, TV, radio and photography studios, a movie hall, a gymnasium and other sports facilities. Teaching is changing as well - once linear dissemination of knowledge, it is becoming "inspired teaching" where you have a truly active role. By means of new technologies and blended methods of e-learning, you will follow some "pre-lessons", in order to attend your classes set to discuss critically the various topics - thus achieving mastery and self-confidence as well as encouraging genius which sets up you to gain experience and learning. Tests and focus groups will enable you to keep in step, take exams regularly, thus optimising your timing. Such teaching aims at making a difference: not just graduates, but all first-class graduates, since your excellence is the key to your future. A real Campus has to involve its students: they shall live and feel it a home of their own, as this University does not only aim at developing top professionals, but also at growing responsible citizens. Thus, our aim is that you can study and - if you wish and prove to deserve it - have also the chance to get a first paid job. Notices of open competition for entrusting students with the main and most qualified services carried out within the University itself will be tailored to you. Such an opportunity will allow you to study and have a chance in your life.